Gate at downtown Bellingham WTA terminal announcing destination Mount Vernon. 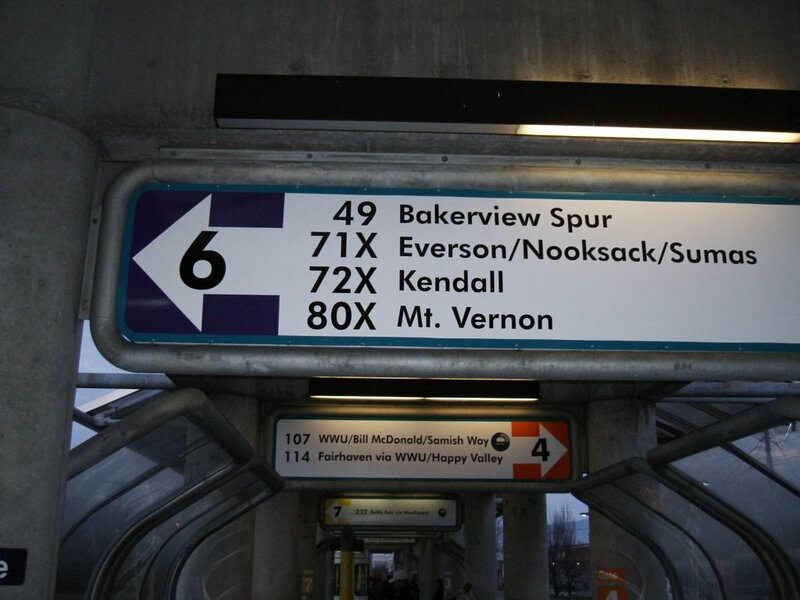 Since September 05, there has been a transit link between Bellingham and Mount Vernon. Called the "County Connector," but maybe it's better to say "Tri County Connector." It's a co-operative service linking transit systems in Whatcom, Skagit and Island Counties. Only costs 50 cents from Bellingham to Mount Vernon! That's about 24 miles. Can't beat the price. * (Now more expensive. This note added Jan. 09). Takes around 42 minutes with only 3 stops in between. This state funded service was designed with students in mind, but it's becoming very popular among working commuters as well. Quite a few folks live in Whatcom County, but work in Skagit County, or visa versa. It has become more popular than expected. Some "libertarian and free market folks" might object because they could see this as unfair "taxpayer supported" competition with private enterprise. Here, the private market has brought us Greyhound bus service between Bellingham and Mount Vernon. Is government really less glamorous than private enterprise? Yes, private enterprise brings us Greyhound; not top of most people's perception of glamor, but it works. I've taken Greyhound to Seattle fairly often. Usually gets one there in 2 hours. It's not bad for 90 miles. Now that Whatcom and Skagit transit sytems are connected, it's possible to ride transit buses all the way to Seattle also; if one knows what they are doing. A friend of mine did it. He had to take buses, from several systems, and spend time waiting for connections. It took him around 4 1/2 hours going by transit. For going that distance, Greyhound is more direct, but my friend had plenty of time. Linking the transit buses is also, of course, a lot less expensive. One of Greyhound's problems is the bus being late leaving Bellingham. That's because it often starts in Vancouver, BC and gets delayed at the border. Sometimes more than an hour. One gets penalized by border delays even if one is not crossing the border! Still, that bus is usually fairly close to being on time. Greyhound is okay. It's still better than all those cars, one hears about on I-5, getting into accidents. "Canada border B.S." doesn't affect County Connector buses which start their trips locally. Another thing that's nice about government provided transit services is the bike racks. Each bus can take up to 3 bicycles. There is a rack in front of the bus. Greyhound doesn't have bike rack service. One can dismantle a bike and ship it in a box. It goes as luggage, but this is much less convenient. One would think Greyhound could look into bike racks on front of their buses thus making some extra money. They could charge for use of the rack space, like selling a seat inside. Where is "innovation" in free enterprise when we need it? That's one thing I like about government transit agencies. They are innovating with different services. Recently the WTA has gone to "3 bike" racks, rather than the old "2 bike" versions. And even bringing one's bike, it's just 50 cents. * (Now more expensive. This note added Jan. 09). Of course private enterprise couldn't compete with a taxpayer subsidized service on price, but Greyhound is still useful, especially for the more direct service to Seattle. It just could innovate a bit more. In this society, governments are often the best crucibles of innovation. To learn more about County Connector, find it under schedules at the WTA web site. My latest Greyhound trip from Seattle to Bellingham was good. An express bus bypassing stops in Everett and Mount Vernon got right to Bellingham early. The person beside me was interested in astronomy and other topics so we could have a great visit. Even though the bus got in early, the passenger, I met on the bus and I went to Skylarks Cafe, in Bellingham's Fairhaven area for more visit. So even on Greyhound, the bus can be okay. 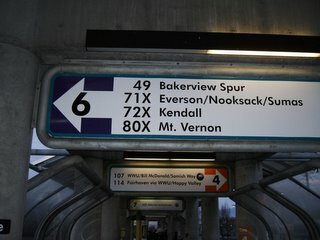 Also, of course, I am a big fan of the County Connector that WTA and Skagit Transit runs between Bellingham and Mount Vernon.